Rubber Castors and Polyurethane Castors are common choice within the material handling industry. They are often used interchangeably, without regard to their unique properties and are typically found on around 80% of all industrial applications. Within this article will look at the Similarities and Differences of each material to ensure that the designer or specifier can make an informed decision of the correct castor for a specific application. So, which are better? Polyurethane Castors Vs Rubber Castors? Unfortunately, (or perhaps fortunately), neither material can be deemed better than the other in general terms, and it is necessary to consider the application in which the Castor Wheel will be used and the mechanical properties and characteristics that are required for the particular application. Whilst both materials fall within the broad category of “Polymers” they have various advantages over each other. It is therefore important that the characteristics of both Rubber Castors and Polyurethane Castors are considered and understood before a material selection is made. A Brief History of Polymers in the Industrial Market. Generally speaking, Polyurethane Castors are more expensive than Rubber Castors, in the region of 30-50% higher. It is therefore important that the best material is selected whilst taking into account the commercial costs of the selection. As discussed above, Rubber Castors and Polyurethane Castors both have their advantages, both offering unique properties to each other. For example, it is common to find equipment which is used outdoors or on rough surfaces to be fitted with Rubber Castors, whilst equipment which is used indoors on smooth floor surfaces are commonly fitted with Polyurethane Castors. Why? It is primarily due to the flooring surface, which is an important consideration for all Castor Wheel Selections. Natural Rubber Castors provide higher grip, better traction and a softer ride over rough terrain compared to Polyurethane Castors. Whilst, Polyurethane Castors provide higher Load Capacity, Wear Resistance and Roll Resistance compared to Rubber Castors. Roll Resistance is an important characteristic for the majority of applications. The lower the roll resistance, the easier it is to manoeuvre the equipment, reducing operator fatigue and increasing the efficiency of the equipment. Polyurethane Castors generally have a lower roll resistance than Rubber Castors. This is primarily due to the synthetic nature of the Polyurethane providing a more homogenous material, in comparison to rubber. The highly consistent mixture of the material provides constant levels of rolling friction. Secondly, Polyurethane Castors can be manufactured in slightly harder compounds, up to approx. 90-95shore A, whilst Rubber Castors typically have a hardness of approx. 75-85sh A. Roll Resistance – Polyurethane Castors Win! Cushioning & Resilience of a Castor Wheel affects the comfort or smoothness of the “ride”. This “Smoothness” characteristic is achieved by the Castor Wheel material absorbing any bumps, obstacles and roughness of the flooring surface. The level of Cushioning or Resilience is determined by the stiffness of the wheel. (i.e. How much does the rubber or polyurethane wheel deform when it runs over a bump or obstacle). In the case of Solid Wheels such as Polyurethane Castors and Polyurethane Castors the Cushioning / Resilience is determined by the hardness of the Polyurethane or Rubber. However, it should also be noted that there are special types of Castors which control cushioning and resilience in different ways, for example “Spring Loaded” Castors, or “Pneumatic” Castors. As mentioned within the “Roll Resistance Section”, Rubber Castors are typically manufactured in 75-85 Shore A, whereas Polyurethane Castors are typically manufactured in 90-95 Shore A. The higher the Shore rating, the harder the material. Therefore, the softer the material, the more it will deform when ran over a bump or obstacle and the higher the absorption, resulting in a smoother ride. It should be noted that generally speaking the higher the cushioning, the higher the roll resistance. It is therefore important that both characteristics are considered together as to which property is most important. Whilst it is possible for both Rubber and Polyurethane to be manufactured in much softer rubbers (at least 30 Shore A), Rubber retains certain key characteristics at lower (softer) shore hardness, such as Tear Strength, and for this reason Polyurethane Castors are generally harder than Rubber Castors. Therefore, Rubber Castors (normally) provide better cushioning than Polyurethane Castors. It should be noted that for many applications, particularly indoor applications on smooth flooring the Castor wheel material makes little difference. The main benefit is outdoors. Polyurethane Castors generally have a higher load capacity than Rubber Castors. This is due to two primary factors; firstly, the hardness of the material; and secondly the fact that Polyurethane Castors can have very thin threads compared to Rubber Castors, which considerably increases the load capacity. In addition, the resistance to “Splitting”, “Tearing” and “Cutting” are all much improved in Polyurethane Castors, compared to Rubber Castors, allowing Polyurethane Wheels to be designed with higher levels of stress without concerns of material damage. This means that if two identical castors, with the only difference being the material (i.e. rubber or polyurethane), the Polyurethane wheel could be stressed to higher levels and hence allowing it to be used at higher loads. Rubbers are manufactured from a mixture of different ingredients, commonly known as a compound (or rubber compound). Rubber Compounds typically have two primary constituents; “Raw Rubber” and “Filler”, in addition to other ingredients in lesser quantity. The filler is used to increase the tensile strength of the material along with a range of other improvements in properties. Carbon Black is the most common filler, and gives Rubber Castors their black colour. Coloured rubber uses alternative fillers, such as Silica. A Rubber Compound will typically have approx. 60-70% Raw rubber and 30-40% Filler. The Carbon Black particles and the molecules of the raw rubber are bonded together by a chemical reaction which produces a mechanical bond between the two parts. Polyurethane material is a synthetic material which is manufactured by a chemical reaction of various elements. Whilst other additives may be mixed with the Polyurethane to increase properties, the composition of the material provides an extremely high proportion of pure Polyurethane, in the region of 95%. Whilst both materials have good levels of Wear & Abrasion resistance, and can have a services life of many years, Polyurethane generally has a much higher level of resistance to wear and abrasion, and under controlled tests can have a life 2-3 times longer than that of a rubber castor wheel. The primary reason for this is due to the high concentration of pure polyurethane in a Polyurethane Castor. On the other hand, the 60/40% mixture of a rubber castor provides many molecular connections which can be damaged under abrasion. With rubber castors, as abrasion occurs, stress is put on the molecular connections between the Raw Rubber and the Carbon black, which in turn can cause failure of the connections resulting in rubber deterioration. Similar to Wear & Abrasion, the material formulation of Rubber Castors and Polyurethane Castors plays in important role to what’s known as “Cutting & Chunking” resistance. This is the materials resistance to “Cuts” in the material, or “Chunks” of materials being torn off during impact with obstacles and foreign objects. This is where rubber formulations can play a role in the resistance of Castor Wheel Cutting & Chunking. High Quality Rubber compounds which have a high percentage of Raw Rubber, and Carbon Black Filler with a small particle size, offer greatly improved resistance compared to a lower percentage of raw rubber and/or large carbon black particles. Of course, lowering the rubber percentage or using low cost (large particle size) carbon black can reduce the cost of the finished product, but at the same time can reduce the performance of the wheel. Unfortunately, it can be very difficult for a non-professional to determine whether the rubber is a high or low grade – after all they generally appear the same, regardless of the mixture. It is therefore important that the customer looks for a reputable supplier and takes into account the costs of purchasing a high quality product. Rubber with low raw rubber content will Cut or Chunk relatively easily, and once a cut forms it will slowly propagate each time a force is applied to that particular area. In Contrast, a high quality rubber castor will be much more resistant to cutting, however it will still propagate over time. Polyurethane is by nature a tough material, and chemically, it is bonded together with a much higher consistency. However, under excessive force the material will still chunk, and cuts may also appear. The big difference to rubber is generally the cuts will not propagate and whilst they will mostly likely turn into chunks over time will provide a prolonged life compared to that of rubber. Standard Rubber Castors are manufactured using Carbon Black Filler (as discussed above). Unfortunately, this Carbon Black will mark floors, particularly wooden & tiled floors and is therefore not suitable for applications where floor marking properties are important. However, with the use of alternative fillers, such as Silica, the rubber can be produced in a non-marking material. The Non-Marking Rubber Castors are generally grey in colour and will not mark the floor. Polyurethane on the other hand does not generally mark flooring. Whilst Polyurethane is generally mixed with a colourant, the chemical make-up of the material locks the colour into the material and cannot leach or mark flooring surfaces. In terms of protection, both Polyurethane Castors and Rubber Castors offer Good to Excellent protection against damage to the floor, due to the resilience of the material. Generally, the softer the material the less likely it will damage the floor. In this aspect Rubber is slightly better due to its difference in hardness. 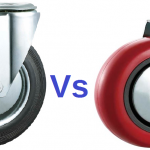 To summaries – Rubber Castors Vs Polyurethane Castors – Both Rubber Castors and Polyurethane Castors have their advantages over each other. Polyurethane is an extremely tough and durable material with the advantage of offering higher load capacities. 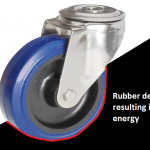 Rubber Castors provide excellent operator comfort and have an advantage over protecting delicate floors. For this reason both Rubber and Polyurethane Castors are common place in the material handling industry. Bulldog Castors Ltd supply a wide range of Castors and Wheels, including both Rubber Castors and Polyurethane Castors. We believe that our company is unique. We employ Polymer Engineers that not only understand the mechanics of Castors & Wheels application, but also have an in depth knowledge of Polymer Technology, backed up with substantial testing and analysis equipment for Polymer based materials. Our team are at hand to offer technical advice, product testing and design to support our customers in providing the best solution to a specific application.